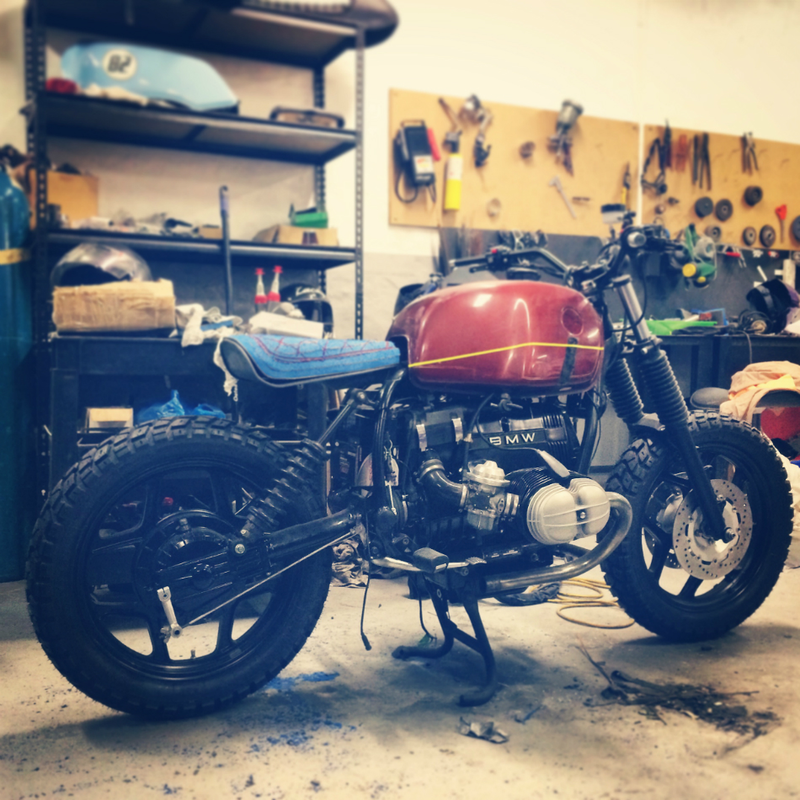 Despite constantly chopping and changing ideas for the seat upholstery and tank paint, we’re getting much closer to completing these aspects of the BMW R80. 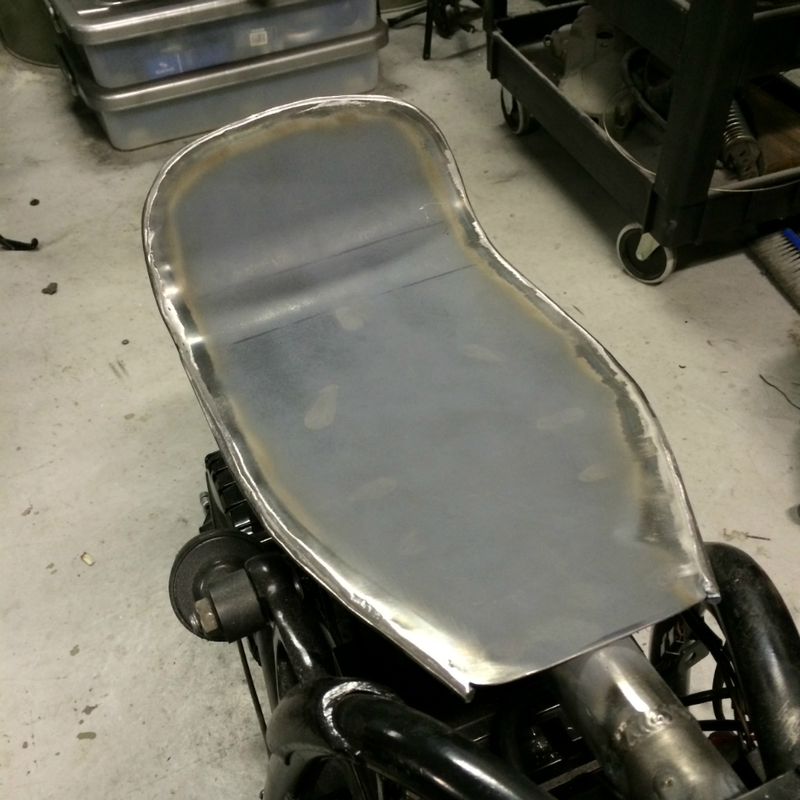 Ren has spent time heating and tack welding round-bar to the outer edge of the seat pan (lower). Once shaped and affixed with tack welds, the whole outer edge was welded up properly and tidied up. The resulting seat pan now has a far cleaner, softer edge. I was fortunate enough to have Ren work on an upper seat pan (removable seat) to mate with the lower seat pan (fixed to the bike). The upper seat pan is affixed to the the lower seat pan with four bolts. Once the seat pan logistics were sorted, we moved onto shaping the core padding of the seat. 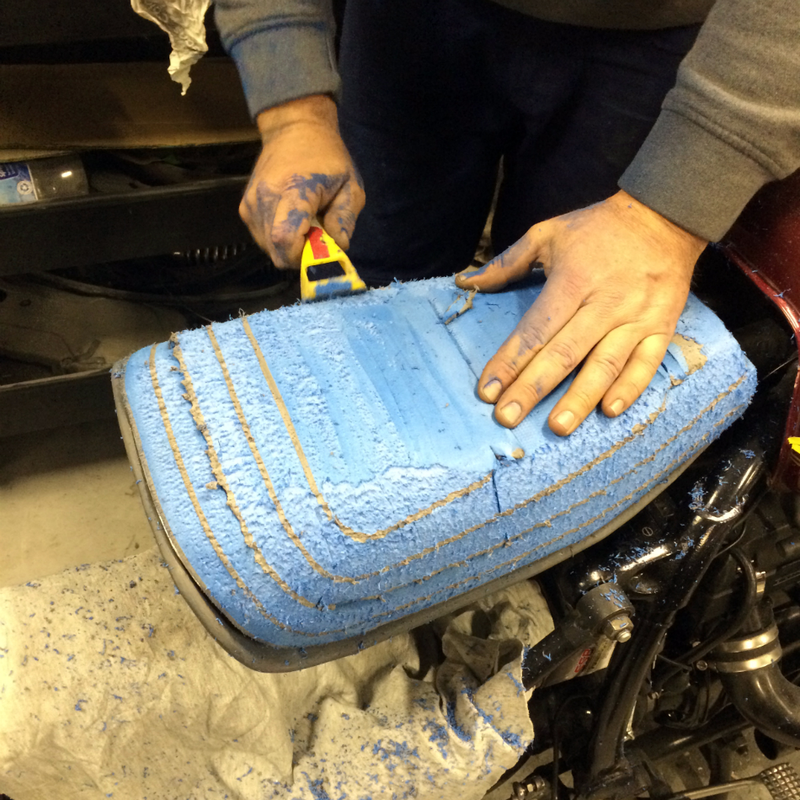 This padding acts to shape the seat itself and will likely be covered in a softer, more forgiving layer to prepare it for upholstery. Ren and I spent quite some time messing with the shape of the padding and the stitching that would fit it best. 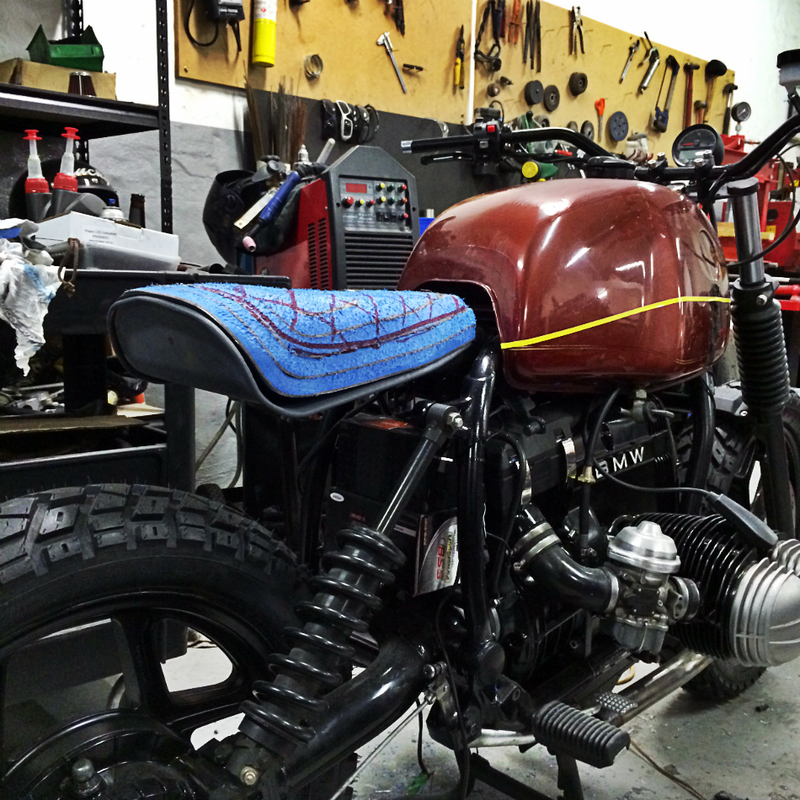 In the end, we settled on a diamond stitch of sorts that will loosely follow the contour of the lower seat pan. With a good idea of how we’ll approach the seat upholstery, it was necessary to look at how to tie this into the tank’s paint layout. I got a hold of some yellow marking tape and began messing around with lines. Nothing is set in stone at this point, however I’d love to have the lines created by the seat and seat pan, pair up with the paint layout on the tank. 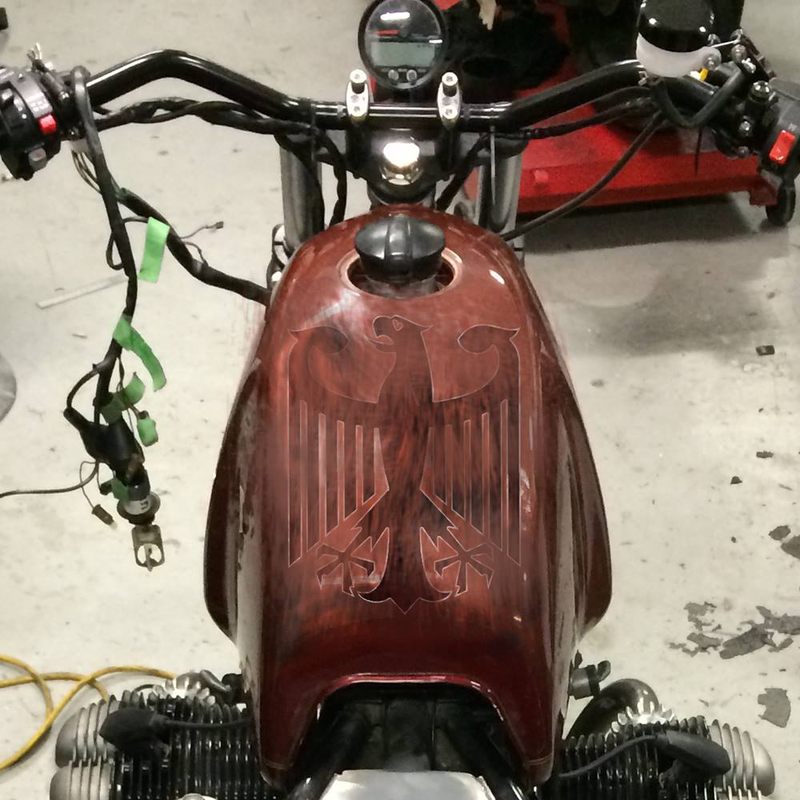 An interesting possibility that I came up with (in order to keep the BMW R80 as close to its heritage) was to potentially work the German “Federal Eagle” coat of arms (Bundesadler) into the design. At this stage I’m sure that I want the tank to appear “ratty” so I spent a few minutes messing around with ideas in Photoshop… But yeah, nothing is final just yet! Tagged 800cc, airhead, BMW, boxer, fabrication, motorbike, motorbikes, motorcycle, motorcycles, paint, project, projects, R80, r80rt, rene9ade, rene9adecustoms, seat. Bookmark the permalink.